The title says it all. Some of the best Pork & Beans/Baked Beans recipes I've tried were slow-cooked for 4 or more hours, but maybe some people don't have that time to spare. This is a VERY simple and quick version and in the end, still soo delicious. I used 2 key ingredients: smoked pork and cinnamon. Adding the cinnamon gave the dish another depth of flavor and sweetness that, I think in combination with the already so flavorful smoked pork, made the dish taste like it's slow-cooked. I don't know why, but it really did. This dish is perfect for the season and can be stored in an airtight container in the fridge for a 5 days - a week. Freezing it lasts even longer. 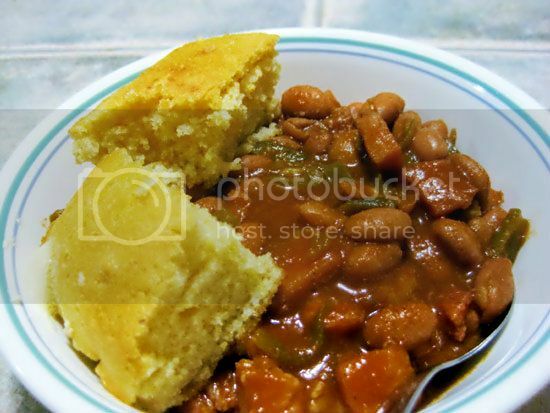 I served this with some homemade corn bread and some rice. In a soup pot, saute together smoked pork, green beans, garlic, and onion in some canola oil until onions are just tender. Add tomato paste and tomato salsa. Continue stirring. Add rest of spices and pinto beans. If you need more liquid, add water. Simmer for another 20 minutes over medium-low heat until liquid is thickened.